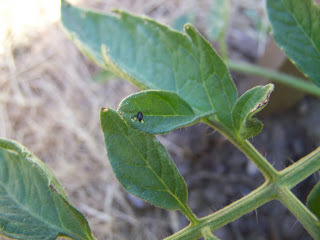 A Handmade Life: Flea beetles on My tomatoes?? 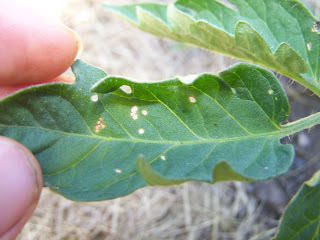 Flea beetles on My tomatoes?? Honey, lay off of my.... tomato plants. Don't you chew on my tomato plants. You can do anything but lay off of my tomato plants. Ahem. I do love my Elvis songs. But seriously, it is a bad idea to mess with my tomato plants, they are the main reason for me gardening...and perhaps one of the reasons I so wanted to live in the Okanagan. Anyway, some of the books I checked suggested a garlic spray - but my garlic is special. I get it from a grower my mom knows and I only got 10 lbs this fall. I have no garlic to spare for nasty little flea beetles. Instead I ran an onion through the blender with some water and strained it to use as a spray. I tested it on two plants but didn't want to spray all my plants just in case the onion spray ( especially in the hot sun) did some damage as well. Being the Impatient Gardener that I am, I spent a ridiculous amount of time going around the garden and squishing the nasty things with my bare fingers....taking great pleasure in it too. It takes quite awhile to squish tiny little flea beetles off of 90 tomato plants. (I'm not entirely sure how I ended up with 90 tomato plants but I did) As I crushed them I thought of all kinds of nasty things about them, I even thought nasty things about all their relatives...and all their future relatives - and what fun that is, it's quite easy to come up with all sorts of rude insults for any little creature who would chew up the leaves of my tomato plants. In the evening I was back at it and when I came across two mating and told my husband about it he asked me if I had squished those ones too. I guess he expected me to show my usual admiration for all things to do with creating life and to spare them. But....I crushed them and felt especially happy that I had prevented another generation of these beggars from being born. E and I were back at it yesterday - squishing and some onion spraying. I learned that if you put them in a bucket of water, instead of squishing, they will find a way to crawl up the sides of the bucket. Better to squish, I say. Afterwards I went to check on the two onion spray test plants and to give them another dose of spray. As I breathed in the evening air I noticed that I was craving onion rings....Elvis would approve, I feel certain. P.S. - If you do know any surefire ways to get rid of flea beetles will you let me know? And just so you know that it isn't all doom and gloom in my garden right now you might want to have a look at these beauties. Do you have Carrots Love Tomatoes? She suggests steeping fresh catnip in water and sprinkling it on plants. She also says Wormwood repells flea beetles. Another book I have says they like dry so maybe a good dousing with the hose a few times a day will send them looking for a new home. I know that has worked well for me getting aphids off my lupines. Hopefully one of these methods will help! I know how much you love your tomato plants! Are you sure that's what they are? "Small shiny black beetles, 3mm long, that jump when disturbed. They hibernate in mulches and plant debris. Feeding starts in spring. Eggs are laid in soil near susceptible plants in late spring and early summer. There is one generation a year. Susceptible plants: brassicas, nasturtium, alyssum, anemone and godetia. 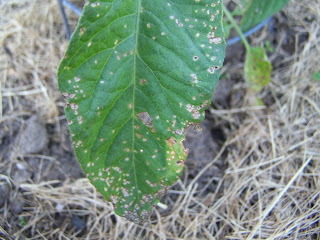 Symptoms: during spring and summer adult beetles eat small holes in leaves and stems which can kill young plants. Damate is always more severe in dry weather. Larvae feed on plant roots (!!!) or in leaf mines. Can be discouraged by watering in full sunlight. Not particularly destructive to eggplant, tomato, turnip or radishes (good news!) The damage is mostly cosmetic and strong plants quickly grow out of it, the plants becoming less attractive to the flea beetles as the leaves enlargen and toughen a little. Light cultivation and the addition of organic matter to the soil both discourage the beetles and help the plants. Bruised (?) elderberry leaves laid over the rows of plants is a deterrent to the beetles and they are also repelled by mint or wormwood. I have loads of elderberry. Want me to bring some next Wednesday? Their favorite food is radishes - so I plant them in and around my other plants. The damage they do to the radish leaves never seems to affect the roots too much. I see their damage as cosmetic - they don't attack the fruit of the tomato or eggplants (I think they like eggplant more than tomatoes :)just the leaves. If they really bother, you - diatomaceous earth (crushed single cell organisms made out of silica - think ultramicroscopic glass shards for bugs) works for any bug with a hard shell. It is harmless to humans - and must be reapplied after rain. The plants are dry because I do like to see how little water I can get by with so I think I will up the water a bit more for now and try some of those other tips. I have loads of catnip so will try that first as I like to solve problems with what I have on hand when possible. It is very comforting to know that it is only cosmetic damage. Thanks again. oooo... thanks for all the information. I have been dealing with these little beasties as well. I am the garden-by-intuition type so I didn't look them up or do any research. My intuition led me to mulch all my beds with (A LOT of) worm castings then cover it with straw. I have been watering them more too and that seems to be helping. The plants are really happy despite the little holes in the leaves so I haven't tried any garlic or anything - although I must admit to squishing a couple of them too. I've got a lot of these in my garden this year, too. Beneficial Nematodes. These microscopic organisms are applied with a hose end sprayer or watered in in some way. They live in the soil and attack over 200 different forms of soil living pests without harming lady bugs, lacewings, praying mantis' and earthworms. Chek them out. I know this was a discussion a few years ago but found it very useful for these dang black fleas on my lovely tomatoes. I'm an organic girl myself so much appreciate the suggestions. Cool blog too! Diatomatious Earth was and is the only thing to kill them. I put it in a large salt shaker and gently shake it on the leaves that I see those critters on. I also sprinkle it on the base of them stems. It will not harm you at all...it is like crushed oysters or diatoms from the sea and it dehydrates the flea beetle. I keep at it daily.